As the Konoki Raiders are dying out and this forum is becoming relatively useless, it will be deleted in one week. for those of you that have nindos, i suggest coping them onto microsoft word. i plan on makeng another form strictly for posting nindos. 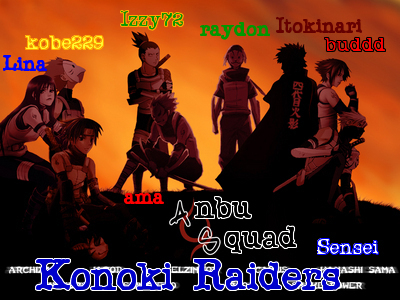 Well, it has been a good ride Konoki Raiders.... I'm srry to see the squad i started about 1 and half year ago end up like this. When i started this squad, the only ppl that r here right now that i imagined putting there r buddd, kobe, and izzy. I've imagined many others part of the squad but most of them r dead now (in game) I've met the rest of you along the way. We have done great things together in c1. I remember several great raids with most of u. There was 1 i did with raydon and ama on one friday i believe. I remember many raids with buddd as well as izzy and kobe. I also remember that when i temporarily quit the game, Izzy took over and created Lazy i believe. ito and candy, i am srry for this but i can only remember 1c that i raider with u. In c1, i believe we were 43rd highest suqad in konoki. In c2, the squad wasn't even made... In c1, Konoki was at the hight of its glory. At this time, Konoki is in ruin just like America's economy lol. I thank everyone for everything they have done. Well, as i have said before it has been a good ride and i hate to see the day when the Konoki Raiders are officialy dead... Remember that you were all ANBU of Konoki, the Konoki Raiders, your leader, Sensei (or currently grandsensei), your co-leaders buddd and Izzy72, and your other squad mates (I apologize if i haven't said ur name) I will give a special note to each of you thru e-mail or pm. Good bye Konoki Raiders.